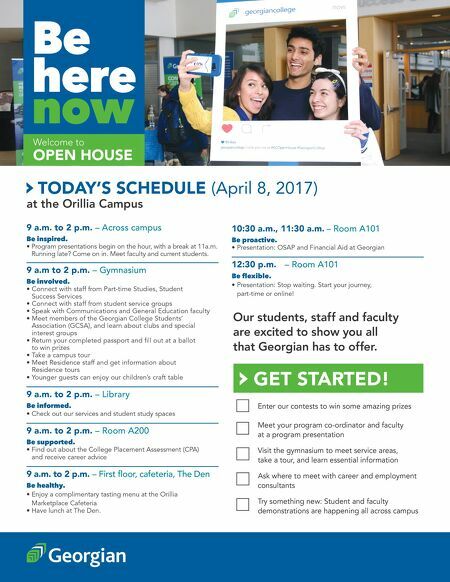 Welcome to OPEN HOUSE TODAY'S SCHEDULE (April 8, 2017) at the Orillia Campus 9 a.m. to 2 p.m. – Across campus Be inspired. • Program presentations begin on the hour, with a break at 11a.m. Running late? Come on in. Meet faculty and current students. 9 a.m to 2 p.m. – Gymnasium Be involved. • Connect with staff from Part-time Studies, Student Success Services • Connect with staff from student service groups • Speak with Communications and General Education faculty • Meet members of the Georgian College Students' Association (GCSA), and learn about clubs and special interest groups • Return your completed passport and fill out at a ballot to win prizes • Take a campus tour • Meet Residence staff and get information about Residence tours • Younger guests can enjoy our children's craft table 9 a.m. to 2 p.m. – Library Be informed. • Check out our services and student study spaces 9 a.m. to 2 p.m. – Room A200 Be supported. • Find out about the College Placement Assessment (CPA) and receive career advice 9 a.m. to 2 p.m. – First floor, cafeteria, The Den Be healthy. • Enjoy a complimentary tasting menu at the Orillia Marketplace Cafeteria • Have lunch at The Den. 10:30 a.m., 11:30 a.m. – Room A101 Be proactive. • Presentation: OSAP and Financial Aid at Georgian 12:30 p.m. – Room A101 Be flexible. • Presentation: Stop waiting. Start your journey, part-time or online! GET STARTED! Enter our contests to win some amazing prizes Meet your program co-ordinator and faculty at a program presentation Visit the gymnasium to meet service areas, take a tour, and learn essential information Ask where to meet with career and employment consultants Try something new: Student and faculty demonstrations are happening all across campus Our students, staff and faculty are excited to show you all that Georgian has to offer.